There’s never been a better time to be a dinosaur hunter — or, if you can’t get your boots out in the field, a fossil fan. Paleontologists are announcing a new species of dinosaur at the rate of about one every two weeks. But are we ever going to find them all? No. There are dinosaurs that we’re never, ever going to find. To understand why, though, you need to know something about how capricious the fossil record is and how paleontologists sift through the past. That we have a fossil record at all is something to be thankful for. Chances are always against an organism being preserved in the rock from the very outset. Envision a wizened old Tyrannosaurus rex stamping along a Cretaceous floodplain. The dinosaur’s a big one – forty feet long and over nine tons, with about 200 bones – but the tyrant’s reign is at an end. The dinosaur’s huge heart gives out and the carnivore’s jaw slams onto the ground as it topples forward. If our dear departed T. rex is going to become a fossil, it’s going to have to be pretty lucky. Meat did not go to waste in the Mesozoic, and we know that hungry tyrannosaurs had no qualms about scavenging their own kind. And that’s not even considering bone-burrowing beetles, bacteria, and the smaller cast of characters that would have helped break down the body. To even have a chance at becoming a fossil – whether intact or disarticulated by the carrion feeders – it’s going to have to be buried quickly. Paleontologist Caitlin Syme has modeled this in the lab with dead crocodiles. Crocs buried quickly maintained their articulation better than those allowed to “bloat and float” in water. In short, the longer a body is exposed, the more likely it is to be torn apart and scattered. This requires a great deal of sediment, especially for an animal as big as our hypothetical T. rex. A dead dinosaur on open ground is unlikely to be blanketed by mud and sand, especially if they die in the dry season. But a dinosaur that dies near a river, lake, or other source of sediment has a better chance of being covered up. So dinosaurs had to die in just the right circumstances in order to be buried. This means that they had to perish in places where sediment was being deposited rather than being eroded away. And this is the first critical part of why we know we’re never going to find all the dinosaurs. The non-avian dinosaurs lived worldwide, on every landmass, for over 180 million years. They undoubtedly trod the uplands and mountains as well as the swamps and lakeshores. We’ll probably never find these mountain dinosaurs. They dwelled in places where sediment was being eroded, not laid down, so even if they were buried in their local habitat, their remains would eventually be scoured away as their highland homes began to crumble. Not that the lowland carcasses had any assurances of one day being discovered, excavated, cleaned up, and pieced back together again. What was left of the dinosaurs had to be safeguarded from decay long enough for the rapid fossilization process to take place. From there the remains had to survive over 66 million years of geologic transformation and upheaval, the buried vestiges of swamps, forests, deserts, lakes, beaches, and other habitats being gradually thrust up to the surface. And of this fraction, only a small percentage of fossils are close enough to the surface for paleontologists to find them. Dinosaur hunters don’t go around digging random holes or using ground-penetrating radar (sorry Jurassic Park, but it doesn’t work). Experts and hordes of volunteers look for dinosaurs that are just starting to peek out of their rocky tombs, crumbs of bone leading up to limb bones or other elements poking out of the prehistoric stone. Of this volume, here and there a short chapter has been preserved; and on each page, only here and there a few lines. Each word of the slowly-changing language, in which the history is supposed to be written, being more or less different in the interrupted succession of chapters, may represent the apparently abruptly changed forms of life, entombed in our consecutive, but widely separated, formations. Darwin wrote this to defend himself against critics who would demand he show them fossils of creatures betwixt and between existing classes like bird and reptile or fish and amphibian. But the point still applies to the broad view of the fossil record. The rock record contains only a fraction of a fraction of a fraction of prehistoric life. We can’t find what isn’t there to be found. Even among the dinosaurs that are ready to be picked up, there’s only a relatively small number of people out in the field during any given season. Researchers pick promising areas based on research questions, the search for particular specimens, ease of access, or to just see what’s out there. This means that some field areas – like the Late Cretaceous of North America – have many groups working them while others are still virtually unknown. As paleontologist Michael Benton found in a study of fossil record bias he published earlier this year, it’s not only the availability of the right rocks that limits the number of dinosaurs we’re likely to find. The way paleontologists look for fossils, often zeroing-in on hotspots where bones have been found before or rumored to exist, also biases what we know of dinosaur history. Erosion doesn’t help any. There may have dinosaur species that we missed out on because their representative bones broke apart before anyone could get to them. Fossil bones can withstand erosion for a long time – such as part of a turtle arm bone that was reunited with its other half after 163 years – but everyone who’s been out in the field is familiar with the depressing bits of “chunkasaurus” that mark places where beautiful bones have busted apart. That’s when you sigh, take another draw from your Camelbak, and trudge on in the hope of finding something better. Then there’s the biological reality of dinosaurs. We’ve probably collected more dinosaur species than we’re ever going to know about. The way paleontologists distinguish one dinosaur from another is on the basis of bones. But we know that there are living animals like some birds, lizards, and fish that have practically identical skeletons but can be told apart on the basis of coloration, their DNA, or some other soft tissue sign. Even though paleontologists have recently cracked the secret of dinosaur color, at least for feathered species, we’re going to miss out on almost all of these “cryptic species.” Going back to our old friend Tyrannosaurus, for example, the dinosaur lived for two million years over a range spanning Saskatchewan to New Mexico. 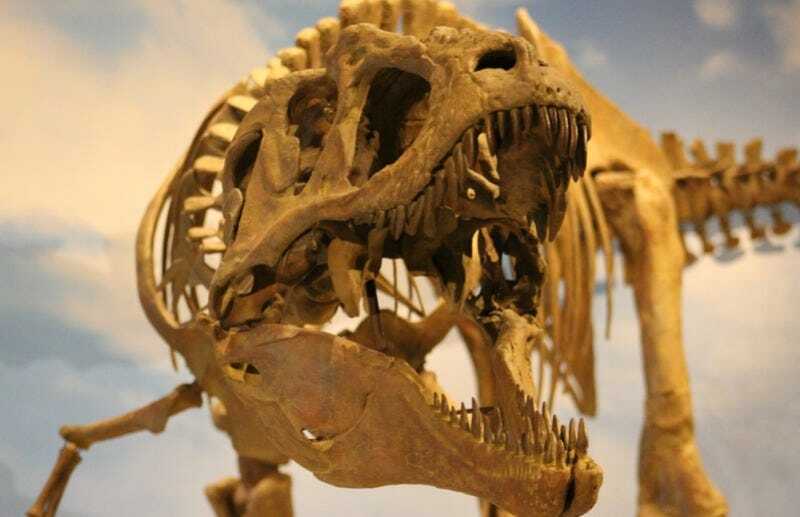 Even though all these skeletons can be assigned to T. rex, it’s possible that North America hosted multiple species of Tyrannosaurus that we simply lack the evidence to pick apart from one another. So no, we’re never going to find all the dinosaurs. Time has taken too much away for that. But there’s no reason to despair. Lest you think we’re approaching peak dinosaur, estimates based on the amount of Mesozoic rock yet to be thoroughly searched suggest that paleontologists have only named about 500 of the 1,800 or so dinosaur genera that existed between 235 and 66 million years ago. The fact that the odds are stacked against discovery makes every new bone strike a reason to celebrate, and, even with the geologic slivers we have, there’s plenty of ground still to cover. Paleontologists are going to be naming new dinosaurs for a very long to come. Right now we’re in the middle of the greatest bone rush in history, supported by the fact that another new dinosaur – an “ostrich mimic” named Totolmimus – was named just in the last couple of weeks. It’s another victory against time and chance, and a reminder that we’re damn lucky to have dinosaurs. Top image: Reconstruction of Lythronax tyrannosaur at Natural History Museum of Utah. Credit: Brian Switek.